It won’t rock a mic like a vandal. It won’t wax a chump like a candle. It won’t cook MC’s like a pound of bacon. But if you have a problem (with drinks getting watery and tasteless after your ice melts), yo, this recipe will solve it. Okay, I’m done, I promise. This post isn’t just a gimmick and it does solve a problem. I’m not a fan of ice cubes because of the way they water down everything you add them to. But flavored ice cubes, well, those are different! As they melt, they add flavor to your drinks instead of taking it away. 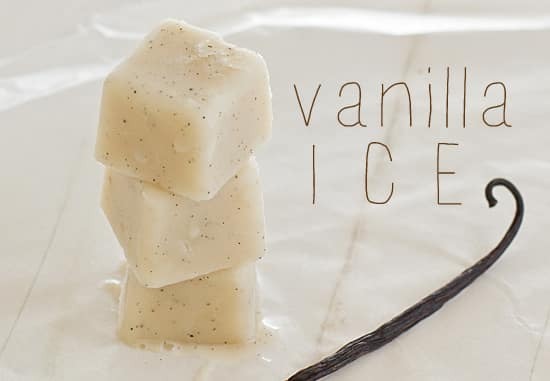 So here are some additional things you should know about Vanilla Ice cubes. First, they don’t always melt all pretty, particularly if your drink is a little bit warm. The vanilla almond milk mixture has a tendency to settle at the bottom of the glass, so give it a little stir. And let the ice melt a little (or a lot!) before you drink–I mean, that’s the whole point of these, right? Edited to Add: I’ve heard from a few people saying that their vanilla ice cubes curdled in their coffee. I couldn’t figure out why since that never happened to me or for the majority of people who made these. After doing some research, I found that occasionally curdling will occur in especially acidic coffees or teas, in drinks made with hard water, or drinks that are very hot. Some brands of non-dairy milk are more prone to curdling than others; I use Silk. Please also note that if you alter the recipe, you may have different results. This Vanilla Ice won’t wax a chump like a candle, but it will keep your iced coffee cold (and delicious). Combine almond milk and sugar in a large saucepan. Slice open vanilla bean lengthwise and scrape insides into saucepan, then place empty vanilla bean into mixture. Bring to a simmer over medium heat, whisking to break up clumps of vanilla. Once mixture has come to a simmer, reduce heat to low and cook 10 minutes more, whisking occasionally. Allow vanilla mixture to come to room temperature. Pour through a fine mesh strainer into a bowl with a spout, then pour mixture into ice cube trays. Freeze until completely solid, 3-4 hours (depending on the temperature of your freezer and size of the cubes). Serve with iced coffee, tea, or other beverages. I’ve tested this recipe with almond milk and refrigerated Silk coconut milk with good results. Other people have reported using dairy milk and cream and have said that the cubes turn out well. Be aware that if you use soy milk, it’s more likely to curdle when added to tea or coffee. I was thinking this would be perfect to make iced coffee! What an awesome idea! They totally are. I wanted to take more photos of the first batch I made and by the time I got around to it, my husband had used them all in his coffee! What a cool pop of flavor it would give! Those are awesome! I”m thinking in chai tea! You’ll want to drink that tea daily and nightly. Will it ever stop? I don’t know. The opening of your post has me cracking up! I love the idea of vanilla ice, which would be perfect in my iced tea! I had it in iced green tea–perfection! Now I’m going to have this song in my head all day 🙂 What a neat idea! I’ve had it in my head all week now–ever since I wrote the post! First off, FABULOUS idea! Second? HAHA omg the whole post, ABSOLUTELY LOVED IT. I can recite Ice, Ice Baby by memory in full. Pinned, shared on FB, tweeted, stumbled, AND +1. Me too. I’ve always had a thing for Vanilla Ice. Like, I even watched that house flipping show he had last year and if my husband tried to talk to me while it was on, I’d be all, “SHHHH!! !” And I’ve seen Cool As Ice more times than I’d like to admit. I deleted about 10 other references from this post because I didn’t want to frighten my readers with my vast knowledge of all things Vanilla Ice. What a great idea! Have to try this. Thank you! 🙂 You will love them–my husband doesn’t even like flavored coffee and he used about 8 of these cubes in a day. I just LOL’d for real. Because you know I like a high hat with a souped up tempo. These look so much better than regular coffee cubes. This is absolutely brilliant! We drink iced coffee every day this time of year and love a flavoring. This is so much healthier than using cream. Thank You! Yup, it’s healthier than cream and much lighter too–perfect for summer! I bet these would be good with Kahlua! I agree with the comment above, but I was thinking it would be great for Bailey’s on ice! All the suggestions you gave are great too .. this is a fantastic idea! Ice ice baby! Perfect for coffee. After the overnight mango oatmeal that you turned me onto and that I’m still eating, by the way, I was pretty sure you were a genius. Now I’m convinced. What a fantastic idea!! Oh those are just brilliant! I’m definitely going to make some to pair up with a vanilla iced coffee. Just made these with granulated splenda and stuck a chai tea bag in while it simmered. UNF! So good!! I usually just drink my coffee black, but you have me thinking I need to expand my horizons and try these awesome cubes! Love the photos too. What a fantastic idea (and even better Vanilla Ice references)! Trying this immediately in honor of my 90s crush Robert matthew Van Winkle. For real! Ha! You know his middle name? Okay, I officially cede the biggest Vanilla Ice fan crown to you. 🙂 And thanks for the kind words about my blog! I’m glad I found this post because yesterday I was having a watered-down-iced-coffee crisis and I decided that I really should find a way to make ice cubed that won’t ruin my iced coffee experience. Will give this recipe a try later today! I hope you like it! Watered down iced coffee is a sad, sad thing. It tastes SO much better this way–kind of like adding creamer, but much lighter. And colder. This is such a fun idea! Who knew ice cubes could be so pretty! I was really happy the vanilla bean specks showed up in the photos! Wow. You are totally killin’ my brain like a poisonous mushroom – deadly. I’m in love with your vanilla ice. My style’s like a chemical spill, feasible recipes you can vision and feel. Seriously, this is so good…if this ice were a drug, I’d sell it by the gram…LOL! It’s so refreshing to read peoples’ blogs and know that it’s not just my sisters and I that have the same sense of humor and also know all those old ’80’s lyrics!! And, you SO should’ve ended with Word to your Mother!! Id’ve simutaniously spit my coffee, died laughing and peed myself!! Oh well, maybe another time. I kind of like the idea of eating them as popsicles…LOL! They’re really good like that. Although I suggest adding sticks to them. I didn’t and my fingers froze and it was kind of a mess. A delicious mess, but a mess just the same!